A UV-curable cardanol-based monomer (ECGE) was prepared using cardanol and epichlorohydrin, followed by epoxidation of the unsaturation in alkyl side chains of cardanol segments. 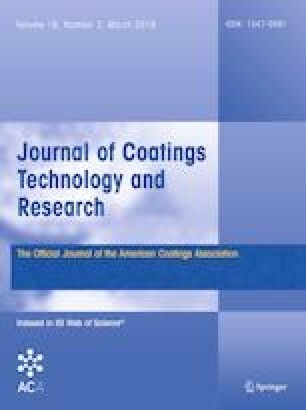 After its chemical structure was confirmed by Fourier transform infrared spectroscopy and proton nuclear magnetic resonance (1H NMR), ECGE was used as a reactive diluent to copolymerize with castor oil-based polyurethane acrylate (PUA) and a series of UV-curable coatings were prepared. Results showed that the viscosity and volume shrinkage of the UV-curable PUA system decreased significantly after the introduction of cardanol-based monomer while maintaining reasonably high bio-renewable contents; when containing 50% of ECGE, the biomass content reaches 66.2%, which is 1.41 times that of pure resin. In addition, the coating properties were evaluated to determine hardness, adhesion, flexibility, and water resistance. The properties of UV-curable thermoset were also studied using tensile testing, dynamic mechanical thermal analysis, and thermogravimetric analysis. The cardanol-based coatings showed excellent adhesion, flexibility, medium hardness, and enhanced char yield although tensile strength, tensile modulus and glass transition temperatures were somewhat diminished. All these performances can be attributed to the unique architectures of ECGE that combined the structural features of rigid benzene ring and long flexible alkyl chains. The UV-curing behavior was determined using real-time IR, and the results indicated that the conversion of unsaturated bond was increased with more concentration of ECGE. We greatly thank to the Natural Science Foundation of Jiangsu Province (BK20161122), Jiangsu Province Biomass Energy and Materials Laboratory (JSBEM-S-201501), the Fundamental Research Funds of CAF (CAFYBB2017QB006), and the Fundamental Research Funds from Jiangsu Province Biomass and Materials Laboratory (JSBEM-S-2017010) for financial support.